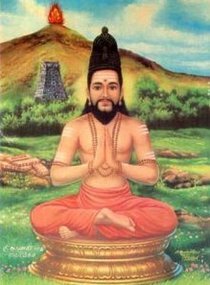 Arunagirinathar is reknowned as one of Tiruvannamalai's most famous saints. 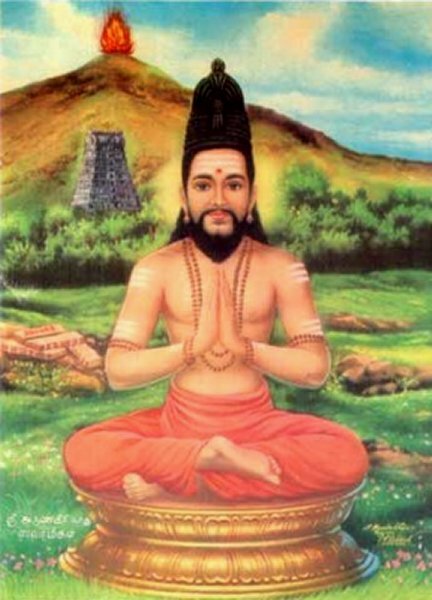 He was a Murugan bhakta who lived at the foot of Arunachala in the fourteenth century. Reliable information about him is hard to come by for the earliest account of his life was not published until the nineteenth century, about 500 years after he died. This version, which has several variations, contains the following principal elements. Arunagirinathar was born in Tiruvannamalai and spent the greater part of his life there. He was reputed to be the son of a courtesan called Muttammai. As he grew up he found the company of courtesans so attractive, he spent most of his time in their houses. When his mother died, all the properties he inherited from her were squandered to pay for his lust. Arunagirinathar had a sister, Adi, who was very fond of him. Taking advantage of her affection, Arunagirinathar persuaded her to part with her jewels and all her other possessions so that he could continue to indulge his appetite for the local courtesans. He continued with this way of life for many years. As he became older, his body became diseased and the better class of courtesan began to jeer at him and avoid his company. The major turning point in his life occurred when he had spent all his sister's money. Not knowing that she was destitute, he approached her again in the hope of getting another hand-out. His sister, who had nothing left except the clothes she was wearing, told him that her funds were exhausted. Since she still loved her brother, and since she still wanted to be of assistance to him she offered him her own body, saying, 'If your lust is so insatiable, you can use my body for your sexual satisfaction'. These words deeply affected and shamed Arunagirinathar. He mentally reviewed the wasted years of his life and came to the conclusion that he had been committing crimes against God. As his sense of shame deepened, he decided to commit suicide by jumping off one of the gopurams in the Arunachaleswara Temple. 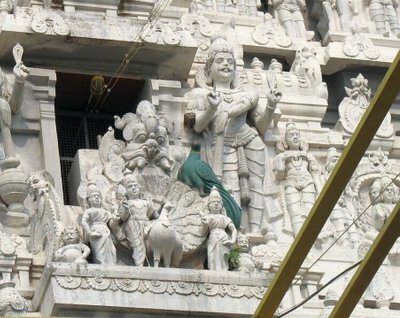 He climbed the tower, but before he was able to jump, Lord Murugan manifested before him and held him back. In some versions of the story, Arunagirinathar actually jumped and Murugan had to catch him before he died on the paving stones below. Murugan embraced him. Then, with his vel, (the spear that he always carries) he wrote a mantra on Arunagirinathar's tongue, gave him a japa mala and commanded him to sing songs in praise of him. Arunagirinathar was initially hesitant, claiming that he had no knowledge of Tamil prosody, but when Murugan encouraged him by giving him the first line of a song, Arunagirinathar found that he could effortlessly compose and sing the remainder. Murugan disappeared, leaving Arunagirinathar a totally transformed man. His diseases vanished and he became an ecstatic bhakta whose devotion manifested as a stream of new songs, all in praise of Murugan, his deliverer. He toured the town of Tiruvannamalai, composing and singing songs as he went. Later on, he travelled throughout India, still singing his songs, and visited many of the country's famous pilgrimage centres. Traditional accounts say that he composed more than 16,000 songs in praise of Murugan. Most of them have been lost, but more than 1,300 of the surviving ones have been collected together in a work called Tiruppugazh (The Glory of God), which has now become one of the classics of Tamil devotional literature. So much for the traditional account. If one turns from this to the historical evidence and the biographical and cultural references in Arunagirinathar's poetry, one is likely to conclude that this account, though it contains a large germ of truth, has been greatly embellished and sensationalised. O Skanda [Murugan]! Glorious God of the hills! Though there is little doubt that the verses of the Tiruppugazh were brought into existence by divine inspiration, a study of their contents reveals that Arunagirinathar was a highly educated man. His songs exhibit a familiarity with the Tevarams, the Tirukkural and numerous other Tamil scriptural and philosophical works. His compositions are also sprinkled with Sanskrit words and expressions which indicate that he had studied the Itihasas, the Puranas, the Gita, the Upanishads, the Agamas and the Mantra and Tantra Sastras. Some commentators feel that the vast erudition he shows in his compositions indicates that he must have come from a family of brahmin pandits. It is not therefore likely that he was the son of a courtesan, for with such a background he would not have received a scholarly education. His life took a change for the better when he came into contact with an unknown mahatma who advised him to meditate on Lord Murugan. Arunagirinathar at first ignored the advice, but after some time he began to meditate in the manner prescribed by the mahatma. For several hours each day he sat in front of an image of Murugan, but his mind, weakened by years of dissipation, was unable to concentrate for any length of time. After his dramatic conversion Arunagirinathar made extensive tours of India, singing Murugan's praises and repeating his name. On many occasions during his travels his devotion was rewarded when Murugan appeared to him in the form of a vision. It is worth examining some of these verses that he sang, for they give a revealing insight into his spiritual state, his beliefs and the practices he enjoined on others. Having been transformed by the grace of the Lord from a life of debauchery to a state of Self-knowledge, Arunagirinathar could speak with authority on the redeeming power of grace, the necessity of surrender, and the effectiveness of meditating on the name and form of the Lord. As a result of his own experiences Arunagirinathar clearly felt that the path of devotion and surrender was the easiest and most direct route to God. He therefore discouraged his listeners from engaging in other practices, deeming them to be either counter-productive or futile. For example, in several of his verses, written from the standpoint of a devotee, he makes very blunt and outspoken remarks about the uselessness of traditional yoga practices. In other places he is equally negative about pandits and philosophers who get bogged down in intellectual disputes about religion. 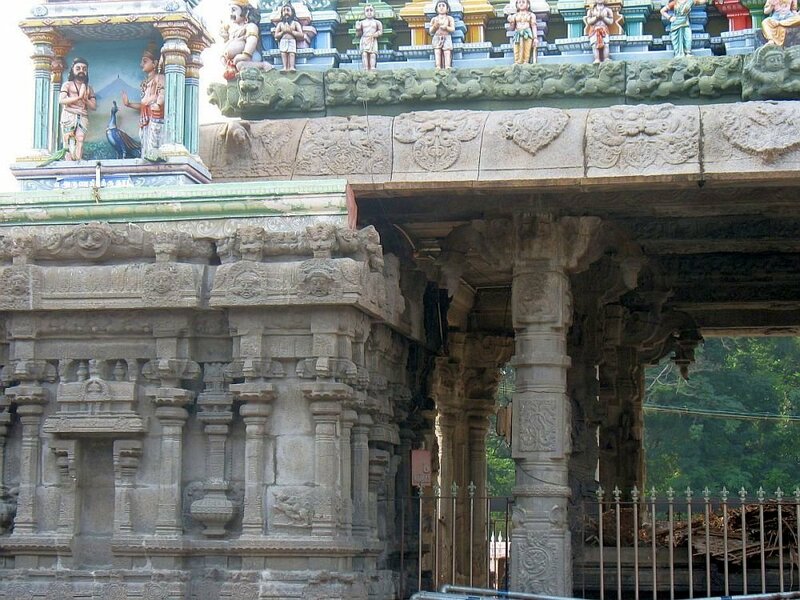 After his extensive pilgrimages, encompassing at least 200 towns, Arunagirinathar finally returned, settled down in Tiruvannamalai and spent the remainder of his life there. The traditional story of his life includes several incidents that took place during this period either in the Arunachaleswara Temple or nearby. In the first of these stories Pravuda Devaraya, the local king, invited him to appear in court because he had heard of Arunagirinathar's high reputation as both a poet and a saint. Arunagirinathar, who had no interest in the affairs of the world, ignored the invitation. Pravuda Devaraya, who had a high regard for scholars and sadhus, then came in person and requested that Arunagirinathar come for a visit to the royal palace. Arunagirinathar, noticing that the king was a devout man, accepted the invitation, went to the palace for a visit and had several honours bestowed on him by the king. In the court of this king there was a famous scholar, Sambandandan, who had a tendency to boast both about his spiritual attainments and his religious knowledge. He had managed to establish himself as a favourite of the king, so when he heard about the reception accorded to Arunagirinathar he felt that his position in court might be threatened. His jealousy motivated him to hatch a plot against Arunagirinathar that he hoped would belittle his new rival in the eyes of the king. Sambandandan had done great tapas earlier in his life, so much so that he had obtained a boon from Kali, his ishta devata (chosen deity), that for a period of twelve years she would appear before him whenever he summoned her. Knowing that he could call on Kali to appear at any time, Sambandandan proposed to the king that he and Arunagirinathar should have competition in which each would try to make his chosen deity manifest in a form that would be visible to everyone. Sambandandan not only persuaded the king to agree to the competition, he also persuaded him to add a stipulation that the loser of the competition should leave the kingdom and never return. Although the king agreed to the rules of the competition, it seems that he did not pass on the full details to Arunagirinathar. He merely told him that he had organised a competition in which the two devotees would try to summon their favourite deities. Arunagirinathar agreed to take part, saying that if Lord Murugan could be persuaded to appear, he would give the king darshan and bless him. The competition was held in public in the Arunachaleswara Temple. Sambandandan, full of confidence, undertook to manifest his God first. To the accompaniment of great pomp and ceremony, he called on Kali to appear, but for some reason she refused to manifest herself. In some versions of the story it is said that the twelve-year period of the boon had expired the previous day, so she was no longer under any obligation to appear. Since Sambandandan was still able to communicate with her, even though he could not make her appear, he got a promise from her that she would hold Murugan tightly in her arms so that he would be unable to manifest when Arunagirinathar called on him. In some versions of the story Murugan manifests immediately, but in other accounts he fails to appear because he is being held tightly by his mother, Kali. In the version in which Murugan is restrained, Arunagirinathar devised a strategy to counter Kali's influence. He first sang another song that was so entrancing, Kali unconsciously began to loosen her grip on her son. When Arunagirinathar sensed that this was happening, he sang a different song that summoned Murugan's vahana, his peacock, to appear and dance before Murugan and Kali. The peacock promptly appeared and danced in such an enticing way, Kali momentarily forgot to hold on tightly to Murugan. 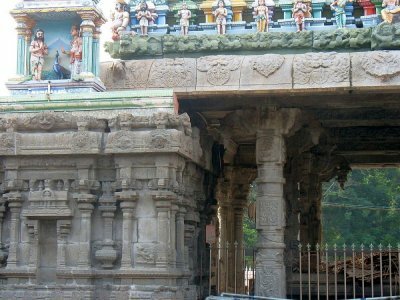 At this crucial moment Murugan leapt out of her arms, mounted his peacock and entered the physical world through one of the pillars of a mantapam in the Arunachaleswara Temple. A temple has since been built around this column to commemorate this great event. The manifestation of Lord Murugan was so dazzling, the light he emanated caused Pravuda Devaraya, the king, to lose his eyesight. There is no mention of a competition in any of the verses, nor are the activities of Sambandandan and Kali alluded to, but there seems to be enough textual evidence to suggest that, prompted by Arunagirinathar, Murugan appeared, mounted on a peacock, before a large assembly of people, including the king, who had gathered there with the express purpose of determining whether or not Arunagirinathar could make his chosen deity appear. The biographies of Arunagirinathar contain another story in which the central event is a competition. A contemporary of Arunagirinathar, an erudite scholar and staunch Vaishnava called Villiputhurar, was responsible for translating the Mahabharata into Tamil verse. This man was so confident that he was a better scholar than anyone else, he toured around the country, challenging all the pandits he met to engage in scholarly competition with him. It is doubtful whether many people accepted his challenge because Villiputhurar made it a condition of the competition that the loser should have his ears cut off. Hearing of Arunagirinathar's fame as an extempore poet, he came to Tiruvannamalai and challenged him to a poetry competition. Under the rules of this contest, Arunagirinathar had to compose extempore verses that Villiputhurar undertook to explain. If Arunagirinathar could compose a verse that Villiputhurar could not ascertain the meaning of, the latter would concede defeat and agree to have his ears cut off. Arunagirinathar in return agreed that he would have his own ears cut off if he failed to produce a verse that baffled Villiputhurar. The competition began with Arunagirinathar composing the verses of a poem that later became known as Kandar Antadi. Villiputhurar easily deciphered the meaning of the first fifty-three verses, but could make no sense of verse fifty-four. It was a cunningly designed verse, a masterpiece of alliterative prosody in which the meaning was deeply buried inside a succession of apparently meaningless syllables, all of which began with the sound of 't.' When Arunagirinathar explained the meaning of the verse, Villiputhurar admitted that he had been defeated. Arunagirinathar, who lacked the vindictive streak that characterised Villliputhurar, allowed the latter to keep his ears. The king, eager to regain his vision, commissioned Arunagirinathar to do the job. In order to reach the heavenly world, Arunagirinathar entered the body of a parrot that had recently died and reanimated it. He left his own body in one of the niches of a gopuram in the Arunachaleswara Temple and flew off the collect the flower. 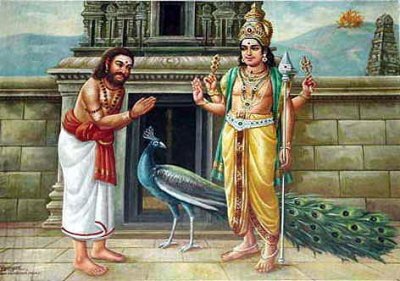 After the parrot had departed on its mission, Sambandandan, who had been watching Arunagirinathar's movements, showed the lifeless body of the poet to Pravuda Devaraya, announced that it was dead, and asked for permission to cremate it. The king agreed and the body was quickly burned. Some time later Arunagirinathar returned with the flower only to discover that he no longer had a human body to return to. He went to the king in his parrot body, restored his eyesight with the parijata flower juice and explained what had happened. Realising that he had been tricked, the king was struck with grief because he knew that it would now be impossible for Arunagirinathar to resume a human form again. Arunagirinathar, on the other hand, was untroubled by this bizarre turn of events. He happily spent the remainder of his life in the parrot's body and even continued to compose poetry in praise of Lord Murugan. It is said that he composed and sang his famous work Kandar Anubhuti and several other poems while he was still occupying the parrot's body. If this story were true, there ought to be some reference to his startling physical transformation in his later works. 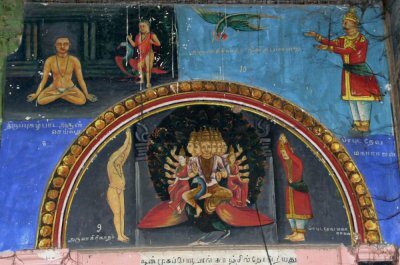 The lack of any such reference has convinced most people that the whole story is an imaginative embroidery on the original, more documented, incident of Murugan manifesting out of a pillar in the Arunachaleswara Temple. [With thanks to the Mountain Path]. 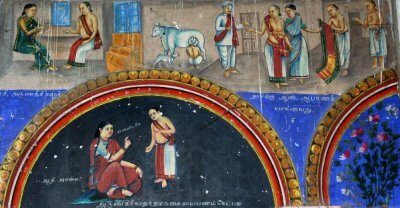 The below photographs are of paintings on the ceiling of the Mandapam inside the Arunachaleswarar Temple compound. The paintings show significant occurences in the life of Arunagirinathar.